BRISTOL - Prior to Monday night’s game against Bristol Central, the Bristol Eastern girls basketball team celebrated Senior Night. As is the custom, the Lancers handed the four Rams seniors a flower to acknowledge the visiting athletes who would be graduating in the spring. Once the game started, Eastern put down the flowers and handed Central a quick beatdown. A 22-0 first quarter left no doubt in the Lancers’ 63-28 win over the Rams, sending Eastern to its fifth straight win and a satisfying home sendoff for the team’s five seniors, including Meredith Forman, who finished with 12 points. While the seniors were honored before tipoff, it was a freshman that shined the brightest in the lopsided first quarter, as Ciara Collins knocked down three 3-pointers while the defense recorded four blocks in a dominant eight minutes. Central’s Ashley Watson finally broke the scoring drought with a layup 50 seconds into the second quarter, but Eastern refused to let up. By the end of the first half, three Lancers were already in double figures. Bristol Eastern head coach Tony Floyd started all five seniors on Senior Night for the Lancers, and they rewarded him by forcing three turnovers on Central’s first three possessions. But the night took an emotional turn when Maura McGuire was taken out just over two minutes in, after falling awkwardly on a block of Central’s Gwen Torreso. McGuire didn’t return, but Eastern responded with an offensive outburst behind Collins that seemed to put the game away in one quarter. Collins scored 11 points in the opening period and had 17 to her credit by halftime. 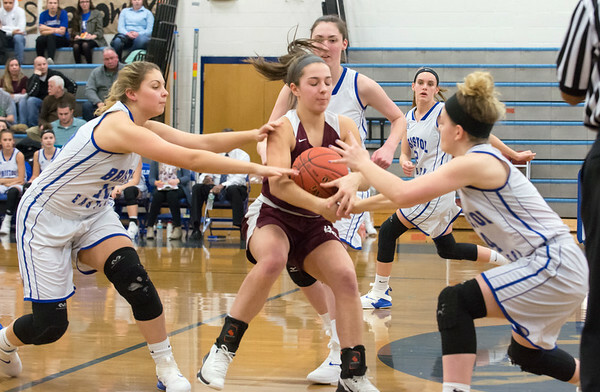 After Watson ended the shutout early in the second, Forman knocked down two 3-pointers to keep the Lancers’ hot streak from deep alive, and keep Eastern’s lead north of 20. By the three minute mark of the third, the advantage was 40, after a 3-pointer from Avery Arbuckle continued the Lancers’ 3-point onslaught. The only Ram who found any space among the Eastern defense was Watson, who finished with 11 points. No other Central scorer had more than five. Posted in The Bristol Press, Bristol Central, Bristol Eastern on Monday, 11 February 2019 21:31. Updated: Monday, 11 February 2019 21:33.